Canadian businessman Isadore Sharp founded Four Seasons in 1960. While a young architect working for his father, Sharp designed a motel for a family friend; its success motivated him to try creating his own hotel. He bought a large parcel of land in a run-down area of Toronto and planned a stopover for business travellers; the Four Seasons Motor Hotel opened in 1961. Four Seasons built more hotels, including the 1963 Inn on the Park, a $4 million two-story resort hotel in suburban Toronto that housed Canada's first discothèque. Upscale luxury became part of the brand when the company expanded to London. When a developer approached Four Seasons about building a hotel in London, Sharp planned it to compete with the city's old-world, elite hotels, such as Claridge's and The Connaught. The hotel opened in 1970. 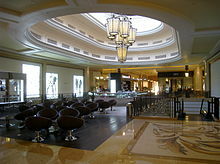 Interior of the Four Seasons Hotel and Resort in Macau. The lead consultant was the architecture firm Aedas. In 1974, cost overruns at the Four Seasons Hotel Vancouver nearly led the company into bankruptcy. As a result, the company began shifting to its current, management-only business model, eliminating costs associated with buying land and buildings. The company went public in 1986. In the 1990s, Four Seasons and Ritz-Carlton began direct competition, with Ritz-Carlton emphasizing a uniform look while Four Seasons emphasized local architecture and styles with uniform service; in the end Four Seasons gained market share. Built in 1986, Four Seasons Hotel Austin is a nine-story hotel on 2.3 acres of land on the Lady Bird Lake's north shore. In 1997, Four Seasons Hotel Austin became the first hotel to have "a high-speed wireless Internet network" after Wayport, Inc. set it up there for testing wireless Internet networks. The hotel hosted Queen Elizabeth II in 1991 when she visited Texas. [dead link] It was acquired by Anbang Insurance Group from the Blackstone Group for $359.7 million in 2016. Economic downturns in the early and mid-2000s affected the company. When the September 11 attacks caused the collapse of the travel industry, Four Seasons refused to cut room prices in order to preserve the perceived value of the brand, which caused tension with property owners who were losing money. The company recovered, and in 2007 it agreed to a buyout by Microsoft Chairman Bill Gates and Prince Al-Waleed bin Talal of Saudi Arabia for $3.8 billion. The pair own 95 percent of the company, in equal shares, and Sharp owns the rest. Challenges returned again during the financial crisis of 2007–2010. The company made the first corporate layoffs in its history, cutting 10% of its Toronto workforce. 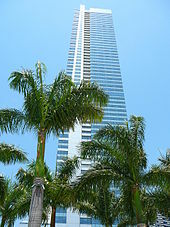 In April 2010, after a year-long dispute with Broadreach Capital Partners and Maritz, Wolff & Co., owners of the Aviara resort near San Diego, an arbitration panel ruled that, while both parties contributed to the demise of the business relationship, Four Seasons had not violated its management agreement. The arbitrators ordered Broadreach to pay Four Seasons to terminate the contract." The resort is no longer a Four Seasons. Four Seasons has continued to add more hotels and resorts to its portfolio, notably in China. It opened a new hotel in Hangzhou in 2010 and Guangzhou, Beijing, and a second property in Shanghai in 2012. In India, it has one hotel in Mumbai. In 2013, it opened its first hotel in Russia in the Lobanov-Rostovsky Palace in St. Petersburg, and later opened a second hotel in Moscow. In Indonesia, it has one hotel in Jakarta and another two in Bali. In October 2012, Four Seasons opened a new 259 room Toronto hotel in Yorkville, designed by internationally known design firm Yabu Pushelberg. The hotel includes an upscale restaurant led by celebrity chef Daniel Boulud. It was hailed by The Globe and Mail as "the renewal of an iconic Canadian brand in its hometown". The penthouse was bought by entrepreneur Robert Österlund (founder of Xacti, LLC and Inbox.com) for a Canadian record price of over $28 million. In 2009, founder Sharp wrote a memoir titled Four Seasons: The Story of Business Philosophy. It contained a historical chronicle of the hotels since its inception. Four Seasons generally earns three percent of the gross income and about five percent of profits from the properties it operates, and the property owners are required to additionally contribute money for chain-wide sales, marketing and reservations systems. Four Seasons hotels have larger staffs than competing chains, and the company maintains separate reserve accounts for each hotel to cover upkeep costs. Profit margins are relatively low, but the brand attracts developers through the hotels' reputation as solid assets for loan collateral or resale. Four Seasons also produces a complimentary magazine for guests that is supported by advertising revenue. Four Seasons has a fractional ownership division, Four Seasons Residence Clubs. Four Seasons Hotels and Resorts began offering vacation rentals in June 2014. Titled Residential Rentals, the properties are available in: North America (Costa Rica, Houston, Jackson Hole, Nevis, Punta Mita, San Diego, Whistler, Vail). Africa (Marrakech, Mauritius, Seychelles, Sharm El Sheikh), Europe (Cap-Ferrat) and Asia (Jimbaran Bay, Chiang Mai, Koh Samui). Residential Rentals provide the same services as Four Seasons Hotels and Resorts in a residential setting. Customers are mainly multi-generational vacationers and small group travellers. Four Seasons has a total of 19 hotels in Europe. Also offers private luxury residences. Travel + Leisure magazine and Zagat Survey rank the hotel chain's properties among the top luxury hotels worldwide. Readers of Conde Nast Traveler magazine have voted Four Seasons Tented Camp Golden Triangle in Chiang Rai, Thailand as among the top ten hotels in the world for three consecutive years. The company has been named one of the "100 Best Companies to Work For" by Fortune every year since the survey's inception in 1998, ranking #47 in 2015, and is lauded for having one of the lowest employee turnover rates in the hospitality industry. In recent years, restaurants at Four Seasons hotels and resorts have been recognized by Zagat and Michelin. The latter has awarded at total of 25 stars to 17 of the company's restaurants, including Four Seasons Hotel Hong Kong (three restaurants), Macau, Paris (three restaurants) and Florence. The company has been recognized by Forbes Travel Guide with many of its properties earning a Forbes Fives Star rating. In 2017, 30 properties received the five-star rating, making it the most five-star ratings earned than any other hotel brand since its inception. TripAdvisor named the Four Seasons Resort Bora Bora #1 Hotel for Romance in the World. The company and its hotels and resorts have been involved in a number of philanthropic programs, with a focus on supporting sustainability, building communities, and advancing cancer research. Four Seasons was one of the founders of the Terry Fox Run in 1981, which has since grown into the world's largest single day cancer fundraiser, with events around the world every September. To date, the Terry Fox Run has raised more than CAD 750 million. In 2001, Four Seasons Resort Maldives started collaborating with the local environmental organization Seamarc/Marine savers, which has set up a program of reimplantation of coral in damaged areas. Thousands of guest-sponsored "coral frames" have been transplanted in Kuda Hurra and Landaa Giraavaru resorts' reefs, and are under survey by marine scientists; they constitute a refuge for thousands of tropical species, and help to preserve and recover fragile ecosystems. On June 19, 2002, the Canadian Opera Company announced Four Seasons Hotels as the naming donor for the COC's new Opera House, also home to the National Ballet of Canada, the Four Seasons Centre for the Performing Arts, located in Toronto, Ontario. ^ "Four Seasons Named to FORTUNE 100 Best Companies to Work For List for 21st Consecutive Year". Retrieved 2019-01-07. ^ "Company Overview of Four Seasons Holdings Inc". investing.businessweek.com. Retrieved 21 August 2014. ^ a b Eric Beaudan (8 May 2012). Creative Execution: What Great Leaders Do to Unleash Bold Thinking and Innovation. John Wiley & Sons. pp. 152–. ISBN 978-1-118-35109-3. ^ a b c d e f g h i David Segal, Pillow Fights at the Four Seasons, The New York Times, June 28, 2009, Accessed June 30, 2009. ^ "Four Seasons Hotels agrees to bid from Gates and Alwaleed - Business - International Herald Tribune". The New York Times. 2007-02-12. ISSN 0362-4331. Retrieved 2018-02-07. ^ JAMES RUSK (October 27, 2004). "Inn on the Park to close doors". The Globe and Mail. ^ Bradbeer, Janice (8 December 2016). "Once Upon A City: Glamour, disco transform suburban North York". The Toronto Star. Retrieved 11 December 2016. ^ "Project page: Venetian Macau Parcel 2 - Fourseas Hotel & Podium MEP Works". byme.com.hk. ^ Dinges, Gary (2015-01-31). "Austin - Four - Seasons for sale - Renovated luxe hotel 2nd high-end inn this week to go on market". Austin American-Statesman. Archived from the original on 2017-09-08. Retrieved 2017-09-08. ^ "Four Seasons Hotel Austin: A waterfront gem in downtown Austin". Forbes Travel Guide. Archived from the original on 2017-09-08. Retrieved 2017-09-08. ^ a b Buchholz, Jan (2016-03-23). "High-profile Austin hotel pricey part of blockbuster Blackstone deal". Austin Business Journal. Retrieved 2017-09-16. ^ Gee, Robert W. (2000-07-21). "Welcome to Plugged Inn - Hotels in Austin and elsewhere cater to tech-savvy travelers (just don't try to cheat the mini-bar)". Austin American-Statesman. Archived from the original on 2017-09-08. Retrieved 2017-09-08. ^ Barnes, Michael (2017-03-08). "When Queen Elizabeth II stayed at the Four Seasons Austin Hotel". Austin American-Statesman. Archived from the original on 2017-09-08. Retrieved 2017-09-08. ^ Staley, Oliver. Four Seasons Hotels agrees to bid from Gates and Alwaleed. Bloomberg News, February 13, 2007. ^ Hudson, Kris (2010-04-20). "Hyatt Takes Over Management of Aviara Resort - WSJ". Online.wsj.com. Retrieved 2015-07-30. ^ Krystina Gustafson (2010-05-18). "Luxury Four Seasons Hotel to Expand in China". Cnbc.com. Retrieved 2015-07-30. 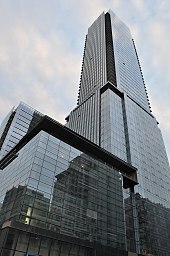 ^ "New five-star hotels raise the bar in Toronto, Vancouver". Globe and Mail. Retrieved February 12, 2013. ^ STEVE LADURANTAYE (May 30, 2011). "Four Seasons penthouse sells for $28-million". The Globe and Mail. ^ "Hotel de Sharp: Lessons From Four Seasons' Founder". ^ "Five-star general: Four Seasons' new CEO and the era of peak hotel luxury". The Globe and Mail. Retrieved 2017-04-19. ^ "Luxe Home Rental Services". Trend Hunter World. 2014-06-19. Retrieved 30 September 2015. ^ "London Luxury Residences - Grosvenor Square - Mayfair - Four Seasons". www.fourseasons.com. ^ "World's Best 2014 | Travel + Leisure". Travelandleisure.com. 2015-06-25. Retrieved 2015-07-30. ^ Richard L. Johnson (2007-05-01). "Zagat's Consumer Survey Rates Amanresorts and Four Seasons Best Hotel Chains in the World; Surveyors Found Four Seasons George V (Paris) the Top Large Hotel / May 2007". Hotel-online.com. Retrieved 2015-07-30. ^ "Top 100 Hotels & Resorts in the World". Condé Nast Traveler. ^ "100 Best Companies to Work For - Fortune". Money.cnn.com. Retrieved 2015-07-30. ^ "Four Seasons Awards and Accolades". ^ "Top 10 Hotels for Romance in the World". Retrieved July 14, 2012. ^ "Cancer Research It's Working" (PDF). Retrieved September 13, 2018. ^ "Reefscapers Story – Coral Reef Propagation". Marinesavers.com. ^ "Four Seasons Centre for the Performing Arts". Canadian Encyclopedia. Wikimedia Commons has media related to Four Seasons Hotels and Resorts.